Received: November 16, 2018; Revised: November 27, 2018; Accepted: November 29, 2018; Published online: January 1, 2019. 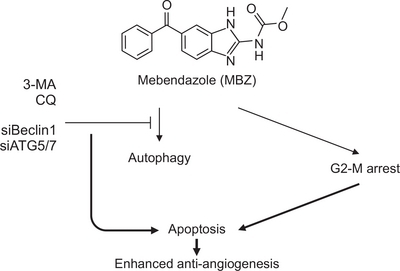 Mebendazole (MBZ), a microtubule depolymerizing drug commonly used for the treatment of helminthic infections, has recently been noted as a repositioning candidate for angiogenesis inhibition and cancer therapy. However, the definite anti-angiogenic mechanism of MBZ remains unclear. In this study, we explored the inhibitory mechanism of MBZ in endothelial cells (ECs) and developed a novel strategy to improve its anti-angiogenic therapy. Treatment of ECs with MBZ led to inhibition of EC proliferation in a dose-dependent manner in several culture conditions in the presence of vascular endothelial growth factor (VEGF), basic fibroblast growth factor (bFGF) or FBS, without selectivity of growth factors, although MBZ is known to inhibit VEGF receptor 2 kinase. Furthermore, MBZ inhibited EC migration and tube formation induced by either VEGF or bFGF. However, unexpectedly, treatment of MBZ did not affect FAK and ERK1/2 phosphorylation induced by these factors. Treatment with MBZ induced shrinking of ECs and caused G2-M arrest and apoptosis with an increased Sub-G1 fraction. In addition, increased levels of nuclear fragmentation, p53 expression, and active form of caspase 3 were observed. The marked induction of autophagy by MBZ was also noted. Interestingly, inhibition of autophagy through knocking down of Beclin1 or ATG5/7, or treatment with autophagy inhibitors such as 3-methyladenine and chloroquine resulted in marked enhancement of anti-proliferative and pro-apoptotic effects of MBZ in ECs. Consequently, we suggest that MBZ induces autophagy in ECs and that protective autophagy can be a novel target for enhancing the anti-angiogenic efficacy of MBZ in cancer treatment. Angiogenesis, a process of new blood vessel formation from pre-existing ones, is involved in many diseases such as cancer, psoriasis, arthritis, and blindness (Carmeliet and Jain, 2000). Several angiogenic growth factors such as vascular endothelial growth factor (VEGF) and basic fibroblast growth factor (bFGF) can induce endothelial cell proliferation, migration and tube formation (Cross and Claesson-Welsh, 2001). Inhibition of angiogenesis is a therapeutic strategy in many angiogenesis-related diseases. Although angiogenesis inhibitors targeting VEGF signaling pathway are affording demonstrable therapeutic efficacy, inherent/acquired resistance to anti-angiogenic agents in both preclinical and clinical settings has been identified (Bergers and Hanahan, 2008; Ferrara, 2010). Thus, development and application of various anti-angiogenic agents with potential to inhibit tumor angiogenesis resistant to anti-VEGF drugs through novel mechanisms are necessary. Mebendazole (MBZ), methyl N-[6-(benzoyl)-1H-benzimidazol-2-yl] carbamate from benzimidazole group is a widely used anti-helminthic drug, which acts as a microtubule-disrupting agent by binding to the colchicine-binding domain of tubulin and prevents microtubule polymerization in a manner similar to other benzimidazoles (Friedman and Platzer, 1980; Laclette et al., 1980). The disruption of microtubule structure by MBZ has been observed in various cell types such as glioblastoma, melanoma and gastric cancer (Doudican et al., 2008; Bai et al., 2011; Pinto et al., 2015). Recently, preclinical studies supported the possibility of MBZ as a potent repositioning candidate in cancer therapy via targeting tumor angiogenesis (Mukhopadhyay et al., 2002; Bai et al., 2015a). Although MBZ inhibits tumor angiogenesis, it has been reported that MBZ does not inhibit endothelial cells (ECs) in culture conditions (Mukhopadhyay et al., 2002; He et al., 2018). However, MBZ has been reported to inhibit autophosphorylation of VEGFR2 (Y1175), which provides a binding site for the phospholipase C gamma (PLCγ) and results in phosphorylation of ERK1/2 (Takahashi et al., 2001; Bai et al., 2015a). However, the definite mechanism of action related to angiogenesis inhibition by MBZ remains unclear. Autophagy is a catabolic pathway activated under cellular stress to homeostasis. During this pathway, aggregation of damaged protein and sequestration of organelles occur within double-membrane organelles (Mizushima, 2007). The formation of autophagosomes is initiated by class III PI3K and Beclin1; furthermore, autophagy-related gene 5 (ATG5) and autophagy-related gene 7 (ATG7) are involved as core proteins in the process. Autophagy works for stress adaptation to avoid apoptosis in certain conditions, whereas it induces cell death in other cellular settings (Maiuri et al., 2007). Some of the anti-angiogenic agents induce autophagy to provide protection to cells (Nguyen et al., 2007; Ramakrishnan et al., 2007; Nguyen et al., 2009; Nishikawa et al., 2010; Zhang et al., 2013; Pathania et al., 2015), while other drugs induce cell death (Belloni et al., 2010; Kumar et al., 2013). Flubendazole, one of the drugs with a structure similar to MBZ, has been reported to induce autophagy (Chauhan et al., 2015; Zhang et al., 2015). In this study, we investigated how MBZ affects EC activities, signaling and autophagy, and attempted to provide an efficient strategy for MBZ treatment for anti-angiogenesis in cancer therapy. Mebendazole (MBZ), 3-methyladenine (3-MA) and CQ diphosphate were purchased from Sigma (St. Louis, MO, USA). MBZ was dissolved in Dimethyl sulfoxide (DMSO), and 3 MA and CQ diphosphate were dissolved in PBS. Human umbilical vein endothelial cells (HUVECs) were isolated from human cords according to a procedure described previously (Jaffe et al., 1973). HUVECs were cultured in HUVEC medium (M199 medium supplemented with 20% fetal bovine serum (FBS, Gibco, Grand Island, NY, USA), 30 μg/ml endothelial cell growth supplements (BD Biosciences, Franklin Lakes, NJ, USA), and 90 μg/ml heparin (Sigma)). HUVECs were seeded at 2×103 cells in each well of a 96-well plate. After 24 h, the cells were serum starved for 4 h, and then treated with or without MBZ in each growth medium for 48 h. Proliferation of the cells was assessed using the MTS Cell Proliferation Assay Kit (Promega Corp., Madison, WI, USA). Four different endothelial growth media were used for proliferation assay: (1) EGM2 (Lonza, Walkersville, MD, USA), (2) HUVEC medium (M199 medium supplemented with 20% FBS, 30 μg/ml endothelial cell growth supplements and 90 μg/ml heparin), (3) M199 medium containing 5% FBS, 90 ug/ml heparin and 10 ng/ml VEGF (Peprotech, Rocky Hill, NJ, USA) and (4) M199 medium containing 5% FBS, 90 ug/ml heparin and 10 ng/ml bFGF (Peprotech). Cell migration assay was performed in a modified Boyden chamber as described previously (Kim et al., 2008). Detached serum starved HUVECs were incubated with MBZ for 30 min and then seeded into upper chamber (2×104 cells). The lower chamber was added with the 5 ng/ml VEGF or 5 ng/ml bFGF in EBM2. Cell migration was allowed for 5 h, and migrated cells were fixed and stained with Diff-quik solution (Sysmex Co., Kobe, Japan). The migrated cells were photographed and counted in five randomly selected fields. Matrigel basement membrane matrix (BD Bioscience) was placed to each well of prechilled 96-well plates and incubated for 30 min. Detached serum starved HUVECs (2×104 cells) were treated with MBZ for 30 min and then added to the top of solidified Matrigel in the well. After 12 h, the formed tubes were photographed and images were analyzed using Image J software (http://rsb.ingo.nih.gov/ij/) to determine the tube length. Western blotting was performed as described previously (Choi et al., 2013). Briefly, total cellular extracts were prepared by lysing cells in lysis buffer, separating on an SDS-PAGE gel, and transferring to nitrocellulose membranes. The membrane was incubated with the designated primary antibodies against phospho-ERK1/2 (pThr202/Tyr204) (Cell signaling technology, Beverly, MA, USA), ERK1/2 (Cell signaling technology), phospho-FAK (pTyr397) (R&D, Minneapolis, MN, USA), FAK (Millipore, Billerica, MA, USA), p53 (Cell signaling technology), Caspase 3 (Abcam, Cambridge, MA, USA), LC3B (Cell signaling technology), Beclin1 (Cell signaling technology), ATG5 (Cell signaling technology), ATG7 (Cell signaling technology) and β-actin (Sigma). Then, the membrane was incubated with respective secondary antibodies (GeneTex, Irvine, CA, USA). Immunoreactive bands were visualized using a chemiluminescent substrate (ECL kit) (GE healthcare, Piscataway, NJ, USA). The band intensity was measured by Image J software. Cell cycle analysis was performed as described previously (Lee et al., 2015). Briefly, HUVECs were seeded, serum starved for 4h and then treated with MBZ for 24, 48 and 72 h respectively. The cells were collected after trypsin treatment, washed with PBS, and fixed with 70% ethanol at −20°C for 18 h. After centrifugation, the cell pellets were resuspended in 1 ml of hypotonic solution containing 50 μg/ml propidium iodide (PI), 0.1% sodium citrate, 0.1% Triton X-100, and 10 μg/ml RNase and incubated in the dark at room temperature for 30 min. The PI fluorescence was measured on a linear scale using a FACScan flow cytometer (FACS Canto II, BD Biosciences) and the cell cycle distribution was analyzed using FlowJo software (TreeStar, Ashland, OR, USA). To investigate apoptosis after drug treatment, cells were stained fluorescently with 4′,6-diamidino-2-phenylindole (DAPI) to detect nuclear condensation and chromatin fragmentation. HUVECs grown on cover slip were treated with MBZ for 24, 48 and 72 h respectively, and then fixed with 4% (v/v) paraformaldehyde for 30 min. Fixed cells stained with 1 μg/ml of DAPI solution (Sigma) for 10 min. Stained cells were then examined under fluorescence microscopy (BX51, Olympus, Middlesex, UK). The percentages of cells were calculated as the number of cells with apoptotic nuclei divided by the total number of cells in each 3 random field. Immunofluorescence for LC3B+ puncta analysis was performed as described previously (Lee and Joe, 2018). Briefly, HUVECs grown on cover slip were treated with MBZ for 24, 48 and 72 h respectively and then fixed with 4% (v/v) paraformaldehyde for 30 min, permeabilized with methanol at −20°C for 10 min, and then covered with 1% BSA for 30 min at room temperature for blocking. Then the cells were incubated with primary antibody against LC3B (Cell signaling technology) at 4°C overnight, and then probed with Alexa Flour 594 goat anti-rabbit secondary antibodies (Thermo scientific, Foster city, CA, USA) at room temperature for 2 h. Nuclei were stained with DAPI (Sigma). Fluorescent signals were detected using fluorescence microscopy (BX51, Olympus). The percentages of autophagic cells were calculated as the number of cells with LC3-positive puncta (≥100 dots/cell) divided by the total number of cells in each 3 random field. Small interfering RNAs (siRNAs) targeting Beclin1, ATG5, ATG7 and control siRNAs (siCTL) were constructed from Bioneer (Deajun, Korea). Sequencing of double stranded siRNAs were as follows: targeting for Beclin1, sense 5′-CAG UUU GGC ACA AUC AAU A dTdT-3′ and antisense 5′-UAU UGA UUG UGC CAA ACU G dTdT-3′; for ATG5, sense 5′-GGA AUA UCC UGC AGA AGA A dTdT-3′ and antisense 5′-UUC UUC UGC AGG AUA UUC C dTdT-3′; for ATG7, sense 5′-GAA GAU AAC AAU UGG UGU AUU dTdT-3′ and antisense 5′-AAU ACA CCA AUU GUU AUC UUC dTdT-3′; for siCTL, sense 5′-GUU CAG CGU GUC CGG CGA G dTdT-3′ and antisense 5′-C UCG CCG GAC ACG CUG AAC dTdT-3′. Cells were seeded at a density of 78 cells/mm2 and cultured for 24 h. The cells were then transfected with 50–100 nM siRNA using Lipofectamine RNAiMAX Transfection Reagent (Invitrogen, Carlsbad, CA, USA) according to the manufacturer’s instructions. After 4 h, the transfection medium was removed, and the cells were incubated in fresh medium 48 h, followed by drug treatments using the same procedure. Data were presented as means ± SE of representative experiments. Differences between groups were analyzed by One-way ANOVA with Turkey test using GraphPad Prism 5 (GraphPad Software, San Diego, CA, USA) for most experiments. p-values less than 0.05 were considered as statistically significant. We investigated whether mebendazole (MBZ) inhibits proliferation of human umbilical vein endothelial cells (HUVECs) under several culture conditions since it has been reported that MBZ inhibits tumor angiogenesis. Exposure of HUVECs to MBZ for 24 h increased the number of shrinking cells upon inhibition of microtubule action and detachment of cells from the culture dish was observed as compared with the control (Fig. 1A). Previously, it has been shown that MBZ has no inhibitory effect on EC proliferation (Mukhopadhyay et al., 2002; He et al., 2018). However, unexpectedly, we found that MBZ dose-dependently inhibits EC proliferation under all the culture conditions. The anti-proliferative effect of MBZ was observed to be dependent on the growth rate in each medium and exhibited some variations. The cells grew slowly in EGM2 (OD490=0.5 at 48 h) compared to M199 containing FBS, VEGF or bFGF (OD490=∼1), and the IC50 value for MBZ treatment in EGM2 (IC50=2.5 μM) was approximately three-fold higher than other groups (IC50=0.7–0.9 μM) (Fig. 1B). The differences in the anti-proliferative effects of MBZ in ECs may be due to the different growth rate in culture conditions and the use of drug concentrations out of effective concentration range. Therefore, our results suggest that MBZ inhibits EC growth and that the anti-proliferative effect is dependent on cell growth rate. As cell migration is another essential step in the angiogenic process, we assessed the effect of MBZ on EC migration induced by VEGF or bFGF, the key factors leading to angiogenesis. Based on modified Boyden chamber assay, it was observed that MBZ significantly inhibited VEGF- or bFGF-induced HUVEC migration in a dose-dependent manner (IC50=0.9 μM and IC50=0.7 μM, respectively) (Fig. 1C, 1D). Next, we examined whether MBZ can inhibit VEGF- or bFGF-induced tube formation, an endothelial function crucial to angiogenesis. It also potently inhibited VEGF- or bFGF-induced tube formation in a dose-dependent manner (IC50=1.5 μM and IC50=0.8 μM, respectively) (Fig. 1E, 1F). Thus, these results suggest that MBZ inhibits EC activities irrespective of the presence of specific growth factor. Since MBZ inhibits VEGF- or bFGF-induced proliferation and migration, we examined whether MBZ affects FAK and ERK1/2 pathways. FAK and ERK1/2 play an important role in growth factor-mediated signaling. In addition, it has been reported that MBZ inhibits VEGFR2 kinase activity with an IC50 of 4.3 μM by inhibiting autophosphorylation of VEGFR2-Y1175 (Bai et al., 2015a), which provides a binding site for phospholipase C gamma (PLCγ), upstream of ERK 1/2 pathway (Takahashi et al., 2001). However, in the present study, treatment with even 10 μM MBZ for 1 h did not affect FAK and ERK1/2 phosphorylation induced by VEGF or bFGF for 10 min and 30 min, respectively (Fig. 2A, 2B). To investigate whether MBZ affects these pathways in a long-term treatment, the cells were treated with MBZ for 24 h in HUVEC medium (Fig. 2C). Likewise, MBZ did not affect FAK and ERK1/2 pathways in long-term treatment. It was apparent that MBZ does not affect growth factor-induced FAK or ERK 1/2 signaling pathways. These results indicate that MBZ may inhibit angiogenesis via another mechanism of action without any impact on FAK or ERK1/2 signaling pathways. To investigate whether MBZ affects cell cycle progression in ECs, HUVECs were treated with MBZ (1, 3 μM) for 24, 48 and 72 h, respectively in HUVEC medium. Upon treatment with 1 μM MBZ, ECs underwent G2-M arrest at 24 h and ultimately apoptosis with time, but no polyploidy was observed. Treatment with 3 μM MBZ potently caused apoptosis even at 24 h and sub-G1 fraction reached up to 64.5% at 72 h of treatment (Fig. 3A). Accordingly, treatment of HUVECs with MBZ (1, 3 μM) for 24, 48 and 72 h increased chromatin condensation and nuclear fragmentation in a dose-dependent manner (Fig. 3B, indicated by arrowheads), as revealed by DAPI staining. Upon treatment with 3 μM MBZ, chromatin condensation and nuclear fragmentation of the attached cells reached up to 34% at 72 h. It has been reported that p53 accumulation leads to EC apoptosis via activation of caspase-3 (Munshi et al., 2002; Niwa et al., 2002). A significant increase in p53 level-up to 2.9-fold was also observed (Fig. 3C). Treatment with MBZ (1, 3 μM) led to a decrease in pro-caspase 3 (inactive form) level and increase in cleaved-caspase 3 (active form) level in a dose-dependent manner (Fig. 3D). Consequently, the results suggest that MBZ induces G2-M arrest and apoptosis in ECs, which may lead to anti-angiogenic activity. We investigated whether MBZ induced autophagy, since flubendazole, a benzimidazole drug with a structure similar to MBZ, has been reported to induce autophagy (Chauhan et al., 2015; Zhang et al., 2015). When the formation of LC3B+ puncta was examined by immunofluorescence in HUVECs treated with MBZ (1, 3 μM) for 24, 48 and 72 h respectively, the percentage of cells with LC3B+ dots also significantly increased by up to 64% (indicated by arrowheads) (Fig. 4A). Western blot analysis revealed an increase in the ratio of LC3B-II/LC3B-I in a dose-dependent manner (Fig. 4B). Subsequently, we addressed the possibility of a correlation of MBZ-induced autophagy with ATG5, ATG7 and Beclin1. Beclin1 is a main regulator for autophagy initiation, and ATG5 and ATG 7 are core proteins involved in autophagosome formation. To examine the correlation between autophagy formation and MBZ treatment, ATG5, ATG7 and Beclin1 were knock downed by treatment of ECs with siATG5, siATG7 and siBeclin1 (Fig. 4C). As can be seen in Fig. 4D, level of LC3B-II/LC3B-I is much higher in MBZ-treated HUVECs compared with non-treated/siCTL-treated cells. Knocking down of Beclin1 (40%) or ATG5/ATG7 (20%) by RNA interference reduced LC3B-II/LC3B-I levels. Apparently, the results indicate that MBZ induces autophagy. Since MBZ induces autophagy in ECs, we examined whether autophagy is correlated with inhibition of EC activity by MBZ. Inhibition of proliferation is an important anti-angiogenic mechanism. Interestingly, knocking down of Beclin1 or ATG5/7 did not prevent the anti-proliferative effect of MBZ in HUVECs. Rather it increased the inhibitory effect of MBZ (Fig. 5A). Thus, we further tested whether autophagy is correlated with anti-endothelial cell activity of MBZ using pharmacological autophagy inhibitors such as 3-MA and CQ. 3-MA inhibits early-stage autophagy by blocking Class III PI3-kinase because autophagosome formation requires class III PI3-kinase activity. CQ inhibits late-stage autophagy by preventing the fusion of autophagosomes with lysosomes (Mizushima et al., 2010). Likewise, 3-MA pre-treatment significantly enhanced the anti-proliferative effect of MBZ (Fig. 5B), and the combination of MBZ and CQ increased the anti-proliferative effect of MBZ compared to single treatment with MBZ (Fig. 5C). In addition, apoptotic cells with chromatin condensation and nuclear fragmentation were significantly increased by knocking down of Beclin 1 or ATG5/7, 3-MA pre-treatment, or combined treatment with CQ (Fig. 5D–5F). Thus, these results suggest that inhibition of autophagy may potentiate the anti-proliferative and pro-apoptotic effect of MBZ on ECs, thereby enhancing the anti-angiogenic activity of MBZ. MBZ binds to the colchicine-binding domain of tubulin and prevents microtubule polymerization (Friedman and Platzer, 1980; Laclette et al., 1980). Our study provides novel findings which state that MBZ induces protective autophagy in ECs, besides inducing G2-M arrest and apoptosis. This study also suggests a novel strategy that anti-angiogenic activity of MBZ can be potentiated by inhibition of protective autophagy. Therefore, it supports that MBZ is a potent repositioning candidate for angiogenesis inhibition and cancer therapy. Since MBZ and chloroquine cross the blood-brain barrier (BBB), MBZ may be applicable in the treatment of brain cancers such as incurable glioblastoma (GBM) and medulloblastoma (Adelusi and Salako, 1982; Bai et al., 2015b). As GBM is a highly vascularized tumor (Wang et al., 2002), targeting both tumor and ECs can be a promising strategy to cure incurable GBM. Indeed, the clinical trial of MBZ is active for newly-diagnosed high-grade glioma patients receiving temozolomide (TMZ). Although it has been reported that the anti-angiogenic effects of MBZ elicit through inhibition of VEGF type 2 receptor kinase activity (Dakshanamurthy et al., 2012; Bai et al., 2015a), our study proves that the concentration of MBZ for anti-endothelial cell activities (proliferation, migration and tube formation) has no effect on FAK and ERK activation. In addition, it was observed that the anti-endothelial cell activities are not dependent on growth factor type since it also potently inhibited bFGF-induced cell proliferation, migration and tube formation. Comparison of the anti-proliferative activity of MBZ in various media revealed that the inhibitory effect is dependent on the cell growth rate. The inhibitory effect of MBZ on cell proliferation was reduced about three folds when HUVECs grew more slowly in EGM2 compared to other medium conditions. Thus, our results clearly indicate that MBZ inhibits pro-angiogenic endothelial cell behaviors without growth factor selectivity. Therefore, it is suggested that MBZ can be used effectively for anti-VEGF drug-resistant pathological angiogenesis. There has been an increase in the evidence proving that anti-angiogenic inhibitors induce autophagy as well as apoptosis in ECs (Nguyen et al., 2007; Ramakrishnan et al., 2007; Nguyen et al., 2009; Belloni et al., 2010; Nishikawa et al., 2010; Kumar et al., 2013; Zhang et al., 2013; Yang et al., 2014; Pathania et al., 2015; Zhang et al., 2018). Some of the anti-angiogenic agents induce autophagy to protect cells and it is associated with resistance to anti-angiogenic therapy (Nguyen et al., 2007; Ramakrishnan et al., 2007; Nguyen et al., 2009; Nishikawa et al., 2010; Zhang et al., 2013; Pathania et al., 2015), while other agents induce autophagic cell death, also known as type II cell death (Belloni et al., 2010; Kumar et al., 2013). For instance, endostatin, an anti-angiogenic drug, induces autophagy with increased Beclin1, and inhibition of autophagy has been reported to potentiate the effect of endostatin by promoting a switch to apoptosis (Nguyen et al., 2009). Similarly, another agent, K5 induces both apoptosis and autophagy, and interference of autophagic survival response potentiates the anti-angiogenic effect of K5 in ECs (Nguyen et al., 2007). It has been reported that magnolol derivative, a drug with anti-angiogenic effect induced autophagy in HUVECs and blockage of the autophagic pathway reversed its anti-angiogenic effect (Kumar et al., 2013). Another report showed that flubendazole, one of the benzimidazoles, is a potent inducer of autophagy and affects autophagy regulators including Beclin1, mTOR, TFEB, and ATAT by disrupting dynamic microtubules and inducing microtubule acetylation (Chauhan et al., 2015). Flubendazole also acts as ATG4B agonist in triple-negative breast cancer (TNBC) (Zhang et al., 2015). Newly synthesized bis-benzimidazole derivates also induce autophagy and promote apoptosis (Wang et al., 2012; Chu et al., 2016). In the present study, we have demonstrated that MBZ induces G2-M arrest, apoptosis and autophagy. Furthermore, it has been shown that interfering with autophagy by knockdown of Beclin1 or ATG5/ATG7, or treatment with autophagy inhibitors such as 3-methyladenine (3-MA) and chloroquine (CQ) dramatically enhances the anti-proliferative effect of MBZ on ECs. Since CQ has been used safely for malaria treatment, it has been in clinical trial for beneficial adjuvant effect in combination with conventional surgery, chemotherapy and radiotherapy (Briceño et al., 2003, 2007). Consequently, clinical application of MBZ and CQ combination appears to be possible. Our study provides important evidence that MBZ induces protective autophagy and autophagy inhibitor can enhance the anti-angiogenic effect of MBZ by increasing apoptosis in ECs (Fig. 6). 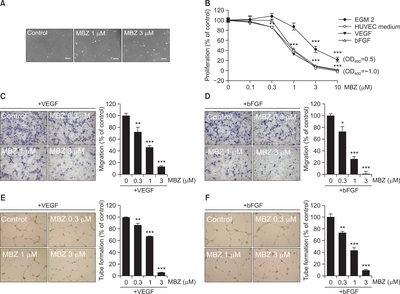 This is the first report to indicate that the anti-angiogenic effect of MBZ is not mediated by inhibition of signaling of growth factors such as VEGF and bFGF, but by induction of G2-M arrest and apoptosis. Also, MBZ induced autophagy to protect ECs from cell death, and interference with autophagic response potentiated the inhibitory effect of MBZ on endothelial behavior. These findings provide a new therapeutic strategy to improve the anti-angiogenic effect of MBZ by regulating autophagy regardless of growth factor signaling. It is suggested that MBZ can be effectively used for the treatment of anti-VEGF drug-resistant tumor angiogenesis. This research was supported by a grant from National Research Foundation of Korea grants funded by the Korea government (NRF-2012R1A5A2047939, NRF-2016R1A2B2013712). Fig. 1. Mebendazole inhibits proliferation, migration and tube formation of ECs. (A) HUVECs were treated with MBZ (1, 3 μM) for 24 h, and observed by light microscopy. Scale bars: 100 μm. (B) HUVECs were treated with the indicated concentrations of MBZ in several medium conditions including EGM2, HUVEC medium, and M199 containing VEGF (10 ng/ml) or bFGF (10 ng/ml). After 48 h, MTS assay was performed. The percentage of proliferation was calculated based on cell proliferation of respective indicated culture medium control group. (C, D) HUVECs pre-treated with MBZ for 30 min were allowed to migrate into bottom chamber with VEGF (5 ng/ml) or bFGF (5 ng/ml) for 5 h. Then, the migrated cells were counted per view field. (E, F) Tube formation of HUVECs pre-treated with MBZ for 30 min on Matrigel was performed in the presence of VEGF (10 ng/ml) or bFGF (10 ng/ml) for 12 h. The mean of total capillary tube length per view field was measured. *p<0.05, **p<0.01, and ***p<0.001 vs. control (MBZ 0 μM) group. Fig. 2. Mebendazole has no inhibitory effect on FAK and ERK1/2 pathways. (A–C) HUVECs were incubated with or without MBZ (10 μM) for 1 h and then stimulated by VEGF (10 ng/ml) (A) or bFGF (10 ng/ml) (B) for indicated time. HUVECs were cultured with or without MBZ (10 μM) for 24 h in HUVEC medium (C). Cells were harvested and analyzed by Western blotting to determine the phosphorylation of FAK (pTyr397) and ERK1/2 (Thr202/Tyr204). FAK, ERK1/2 and β-actin was examined as a loading control. The numbers indicate the ratio of p-ERK1/2 (Thr202/Tyr204)/ERK1/2 or p-FAK (pTyr397)/FAK. Fig. 3. Mebendazole induces G2-M arrest and apoptosis in ECs. (A, B) HUVECs were treated with MBZ (1, 3 μM) for 24, 48 and 72 h, respectively. (A) The distribution of cell cycle was exhibited by flow cytometric analysis (left panel). Comparative quantification of cell percentage in different cell cycle phases is shown by bar diagram (right panel). (B) Cells were fixed and stained with DAPI. Apoptotic cells with chromatin condensation and nuclear fragmentation (arrow heads) were observed in MBZ treated cells and percentage of cells were calculated as the number of cells with apoptotic nuclei divided by the total number of cells in each 3 random field. Scale bar: 100 μm. *p<0.05, **p<0.01, and ***p<0.001 vs. control (MBZ 0 μM) group. (C, D) HUVECs were cultured with or without MBZ (1, 3 μM) for 24 h. Western blot analysis shows p53 (C), pro-Caspase 3 and cleaved-Caspase 3 (D) levels in HUVECs. β-actin was used for a loading control. The numbers indicate relative expression level compared with β-actin. Fig. 4. Mebendazole induces autophagy in ECs. (A) Immunofluorescence staining for LC3B+ puncta in HUVECs treated with MBZ (1, 3 μM) for 24, 48 and 72 h, respectively. Arrow heads indicate the cells with LC3B+ puncta. Scale bar: 50 μm. Assessment of autophagy was performed by counting the number of cells expressing the punctate pattern of LC3B among total cells, after drug treatment. **p<0.01, and ***p<0.001 vs. control (MBZ 0 μM) group. (B) HUVECs were cultured with or without MBZ (1, 3 μM) for 24 h and analyzed by Western blot analysis for LC3B. (C, D) siRNA-transfected HUVECs were treated with MBZ (1, 3 μM) for 24 h. ATG5, ATG7, Beclin1 (C) and LC3B (D) levels were measured through Western blot analysis. β-actin was examined as a loading control. Expression levels of LC3B-II and LC3B-I were normalized with β-actin, and LC3B-II/LC3B-I in each sample was calculated based on the respective siCTL-treated or non-treated group. Fig. 5. Blocking of autophagy enhances the effect of MBZ on ECs. (A, D) siRNA-transfected HUVECs were treated with the indicated concentration of MBZ (0.3, 1 μM) for 48 h. (B, E) HUVECs were pre-treated with 3-MA for 48 h before MBZ (0.3, 1 μM) treatment. 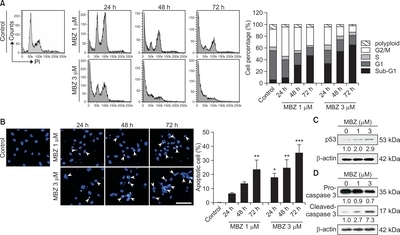 Then, the cells were cultured further in the presence of MBZ for 48 h. (C, F) HUVECs were treated with MBZ for 24 h, and then treated with CQ for 48 h. (A–C) MTS assay was performed to determine cell proliferation. (D–F) Cells were fixed and stained with DAPI. Percentages of apoptotic cells were calculated as the number of cells with chromatic condensation and nuclear fragmentation (arrow heads) divided by the total number of cells in each 3 random field. Scale bar: 100 μm. *p<0.05, **p<0.01, and ***p<0.001 vs. MBZ 0 μM/siCTL or non-treated (Non) group. &p<0.05, &&p<0.01 vs. MBZ 0.3 μM/siCTL or non-treated group; #p<0.05, ##p<0.01, and ###p<0.001 vs. MBZ 1 μM/siCTL or non-treated group. Fig. 6. A possible mechanism of enhancing the anti-angiogenic effect of MBZ through autophagy inhibition in ECs. MBZ induces G2M arrest, apoptosis and autophagy. Interference with autophagic response potentiates the anti-angiogenic effect of MBZ in ECs. Adelusi, SA, and Salako, LA (1982). Tissue and blood concentrations of chloroquine following chronic administration in the rat. J. Pharm. Pharmacol. 34, 733-735. Bai, RY, Staedtke, V, Aprhys, CM, Gallia, GL, and Riggins, GJ (2011). Antiparasitic mebendazole shows survival benefit in 2 preclinical models of glioblastoma multiforme. Neuro. Oncol. 13, 974-982. Bai, RY, Staedtke, V, Rudin, CM, Bunz, F, and Riggins, GJ (2015a). Effective treatment of diverse medulloblastoma models with mebendazole and its impact on tumor angiogenesis. Neuro. Oncol. 17, 545-554. Bai, RY, Staedtke, V, Wanjiku, T, Rudek, MA, Joshi, A, Gallia, GL, and Riggins, GJ (2015b). Brain penetration and efficacy of different mebendazole polymorphs in a mouse brain tumor model. Clin. Cancer Res. 21, 3462-3470. Belloni, D, Veschini, L, Foglieni, C, Dell’Antonio, G, Caligaris-Cappio, F, Ferrarini, M, and Ferrero, E (2010). Bortezomib induces autophagic death in proliferating human endothelial cells. Exp. Cell Res. 316, 1010-1018. Bergers, G, and Hanahan, D (2008). Modes of resistance to anti-angiogenic therapy. Nat. Rev. Cancer. 8, 592-603. Briceño, E, Calderon, A, and Sotelo, J (2007). Institutional experience with chloroquine as an adjuvant to the therapy for glioblastoma multiform. Surg. Neurol. 67, 388-391. Briceño, E, Reyes, S, and Sotelo, J (2003). Therapy of glioblastoma multiforme improved by the antimutagenic chloroquine. Neuroseg. Focus. 14, e3. Carmeliet, P, and Jain, RK (2000). Angiogenesis in cancer and other diseases. Nature. 407, 249-257. Chauhan, S, Ahmed, Z, Bradfute, SB, Arko-Mensah, J, Mandell, MA, Choi, SW, Kimura, T, Blanchet, F, Waller, A, Mudd, MH, Jiang, S, Sklar, L, Timmins, GS, Maphis, N, Bhaskar, K, Piguet, V, and Deretic, V (2015). Pharmaceutical screen identifies novel target processes for activation of autophagy with a broad translational potential. Nat. Commun. 6, 8620. Choi, M, Lee, HS, Naidansaren, P, Kim, HK, O, E, Cha, J. H., Ahn, H. Y., Yang, P. I., Shin, J. C., and Joe, Y. A (2013). Proangiogenic features of Wharton’s jelly-derived mesenchymal stromal/stem cells and their ability to form functional vessels. Int. J. Biochem. Cell Biol. 45, 560-570. Chu, N, Yao, G, Liu, Y, Cheng, M, and Ikejima, T (2016). Newly synthesized bis-benzimidazole compound 8 induces apoptosis, autophagy and reactive oxygen species generation in HeLa cells. Bioorg. Med. Chem. Lett. 26, 4367-4371. Cross, MJ, and Claesson-Welsh, L (2001). FGF and VEGF function in angiogenesis: signalling pathways, biological responses and therapeutic inhibition. Trends Pharmacol. Sci. 22, 201-207. Dakshanamurthy, S, Issa, NT, Assefnia, S, Seshasayee, A, Peters, OJ, Madhavan, S, Uren, A, Brown, ML, and Byers, SW (2012). Predicting new indications for approved drugs using a proteochemometric method. J. Med. Chem. 55, 6832-6848. Doudican, N, Rodriguez, A, Osman, I, and Orlow, SJ (2008). 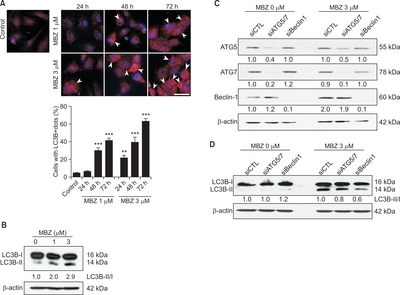 Mebendazole induces apoptosis via Bcl-2 inactivation in chemoresistant melanoma cells. Mol. Cancer Res. 6, 1308-1315. Ferrara, N (2010). Pathways mediating VEGF-independent tumor angiogenesis. Cytokine Growth Factor Rev. 21, 21-26. Friedman, PA, and Platzer, EG (1980). Interaction of anthelmintic benzimidazoles with Ascaris suum embryonic tubulin. Biochim. Biophys. Acta. 630, 271-278. He, L, Shi, L, Du, Z, Huang, H, Gong, R, Ma, L, Chen, L, Gao, S, Lyu, J, and Gu, H (2018). Mebendazole exhibits potent anti-leukemia activity on acute myeloid leukemia. Exp. Cell Res. 369, 61-68. Jaffe, EA, Nachman, RL, Becker, CG, and Minick, CR (1973). Culture of human endothelial cells derived from umbilical veins. Identification by morphologic and immunologic criteria. J. Clin. Invest. 52, 2745-2756. Kim, HK, Oh, DS, Lee, SB, Ha, JM, and Joe, YA (2008). Antimigratory effect of TK12 is mediated in part by interfering with integrin alpha2beta1. Mol. Cancer Ther. 7, 2133-2141. Kumar, S, Guru, SK, Pathania, AS, Kumar, A, Bhushan, S, and Malik, F (2013). Autophagy triggered by magnolol derivative negatively regulates angiogenesis. Cell Death Dis. 4, e889. Laclette, JP, Guerra, G, and Zetina, C (1980). Inhibition of tubulin polymerization by mebendazole. Biochem. Biophys. Res. Commun. 92, 417-423. Lee, SG, and Joe, YA (2018). Autophagy mediates enhancement of proangiogenic activity by hypoxia in mesenchymal stromal/stem cells. Biochem. Biophys. Res. Commun. 501, 941-947. Lee, SW, Kim, HK, Lee, NH, Yi, HY, Kim, HS, Hong, SH, Hong, YK, and Joe, YA (2015). The synergistic effect of combination temozolomide and chloroquine treatment is dependent on autophagy formation and p53 status in glioma cells. Cancer Lett. 360, 195-204. Maiuri, MC, Zalckvar, E, Kimchi, A, and Kroemer, G (2007). Self-eating and self-killing: crosstalk between autophagy and apoptosis. Nat. Rev. Mol. Cell Biol. 8, 741-752. Mizushima, N (2007). Autophagy: process and function. Genes Dev. 21, 2861-2873. Mizushima, N, Yoshimori, T, and Levine, B (2010). Methods in mammalian autophagy research. Cell. 140, 313-326. Mukhopadhyay, T, Sasaki, J, Ramesh, R, and Roth, JA (2002). Mebendazole elicits a potent antitumor effect on human cancer cell lines both in vitro and in vivo. Clin. Cancer Res. 8, 2963-2969. Munshi, N, Fernandis, AZ, Cherla, RP, Park, IW, and Ganju, RK (2002). Lipopolysaccharide-induced apoptosis of endothelial cells and its inhibition by vascular endothelial growth factor. J. Immunol. 168, 5860-5866. Nguyen, TM, Subramanian, IV, Kelekar, A, and Ramakrishnan, S (2007). Kringle 5 of human plasminogen, an angiogenesis inhibitor, induces both autophagy and apoptotic death in endothelial cells. Blood. 109, 4793-4802. Nguyen, TM, Subramanian, IV, Xiao, X, Ghosh, G, Nguyen, P, Kelekar, A, and Ramakrishnan, S (2009). 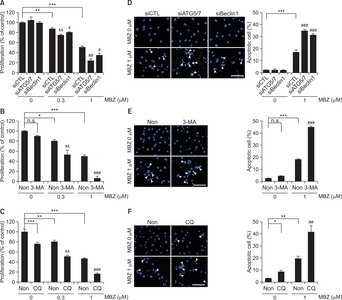 Endostatin induces autophagy in endothelial cells by modulating Beclin 1 and betacatenin levels. J. Cell. Mol. Med. 13, 3687-3698. Nishikawa, T, Tsuno, NH, Okaji, Y, Sunami, E, Shuno, Y, Sasaki, K, Hongo, K, Kaneko, M, Hiyoshi, M, Kawai, K, Kitayama, J, Takahashi, K, and Nagawa, H (2010). The inhibition of autophagy potentiates anti-angiogenic effects of sulforaphane by inducing apoptosis. Angiogenesis. 13, 227-238. Niwa, K, Inanami, O, Yamamori, T, Ohta, T, Hamasu, T, Karino, T, and Kuwabara, M (2002). Roles of protein kinase C delta in the accumulation of P53 and the induction of apoptosis in H2O2-treated bovine endothelial cells. Free Radic. Res. 36, 1147-1153. Pathania, AS, Wani, ZA, Guru, SK, Kumar, S, Bhushan, S, Korkaya, H, Seals, DF, Kumar, A, Mondhe, DM, Ahmed, Z, Chandan, BK, and Malik, F (2015). The anti-angiogenic and cytotoxic effects of the boswellic acid analog BA145 are potentiated by autophagy inhibitors. Mol. Cancer. 14, 6. Pinto, LC, Soares, BM, Pinheiro Jde, J, Riggins, GJ, Assumpcao, PP, Burbano, RM, and Montenegro, RC (2015). The anthelmintic drug mebendazole inhibits growth, migration and invasion in gastric cancer cell model. Toxicol. In Vitro. 29, 2038-2044. Ramakrishnan, S, Nguyen, TM, Subramanian, IV, and Kelekar, A (2007). Autophagy and angiogenesis inhibition. Autophagy. 3, 512-515. Takahashi, T, Yamaguchi, S, Chida, K, and Shibuya, M (2001). A single autophosphorylation site on KDR/Flk-1 is essential for VEGF-A-dependent activation of PLC-gamma and DNA synthesis in vascular endothelial cells. EMBO J. 20, 2768-2778. Wang, R, Chadalavada, K, Wilshire, J, Kowalik, U, Hovinga, KE, Geber, A, Fligelman, B, Leversha, M, Brennan, C, and Tabar, V (2002). Globlastoma stem-like cells give rise to tumour endothelium. Nature. 468, 829-833. Wang, XJ, Chu, NY, Wang, QH, Liu, C, Jiang, CG, Wang, XY, Ikejima, T, and Cheng, MS (2012). Newly synthesized bisbenzimidazole derivatives exerting anti-tumor activity through induction of apoptosis and autophagy. Bioorg. Med. Chem Lett. 22, 6297-6300. Yang, SY, Kim, NH, Cho, YS, Lee, H, and Kwon, HJ (2014). Convallatoxin, a dual inducer of autophagy and apoptosis, inhibits angiogenesis in vitro and in vivo. PLoS ONE. 9, e91094. Zhang, L, Guo, M, Li, J, Zheng, Y, Zhang, S, Xie, T, and Liu, B (2015). Systems biology-based discovery of a potential Atg4B agonist (Flubendazole) that induces autophagy in breast cancer. Mol. Biosyst. 11, 2860-2866. Zhang, L, Jing, H, Cui, L, Li, H, Zhou, B, Zhou, G, and Dai, F (2013). 34-Dimethoxystilbene, a resveratrol derivative with anti-angiogenic effect, induces both macroautophagy and apoptosis in endothelial cells. J. Cell. Biochem. 114, 697-707. Zhang, Q, Li, Y, Miao, C, Wang, Y, Xu, Y, Dong, R, Zhang, Z, Griffin, BB, Yuan, C, Yan, S, Yang, X, Liu, Z, and Kong, B (2018). Anti-angiogenesis effect of Neferine via regulating autophagy and polarization of tumor-associated macrophages in high-grade serous ovarian carcinoma. Cancer Lett. 432, 144-155.